I havent had any chance of getting on here to write, my apologies, but all is great!!! Many good things on the go!! We have done much scouting through out the area. We have seen much huge grizzly sign and scouted some excellent areas for our next Grizzly season. 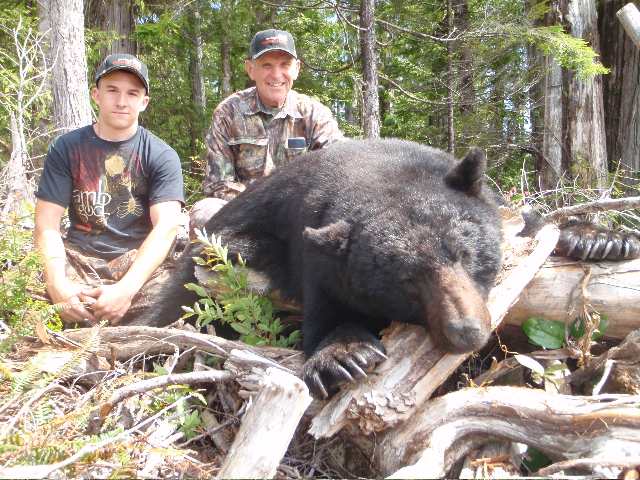 The trails from these giant bears from over the years are everywhere and we have cleared some areas for future tree stands over the small creeks that will be full of salmon and grizzlies, and did some work to our cabins in this area. Brett will be back with me opening day to find the makers of the numerous huge tracks we have found in this amazing area. Some very sad news from my hometown of Port McNeill. Luke Stoner, a very hard working, well respected young man, was taken away from us this week in a work related accident. I have known the Stoner family for many years and they are an extremely well respected family in our community. Luke was married and had one young boy and another baby expected in June. One of my main guides "Oli" was related to the family and a cousin to Luke. Our sincere condolences go out to Luke's Families.